Wilwood EXP Super Hi-Temp 600 Plus Racing Brake Fluid has been specially formulated for racing applications where brake systems consistently operate at very high temperatures. In addition to guarding against vapor lock, EXP Super Hi-Temp 600 Plus Racing Brake Fluid maintains its viscosity and lubricity under extreme temperatures for maintaining brake system reliability and performance. EXP Super Hi-Temp 600 Plus Racing Brake Fluid conforms to, and exceeds U.S. specification FMVSS No. 116 DOT 4. Typical dry boiling point: 594° F (312° C). Typical wet boiling point: 399° F (204 °C). BRAKE FLUID: Due to the extreme operating temperatures of a high performance brake system, standard off-the-shelf brake fluids are not recommended. Of critical importance in determining a fluids ability to handle high temperature applications is the Dry Boiling Point and compressibility. The Dry Boiling Point is the temperature at which a brake fluid will boil in its virgin non-contaminated state. The highest temperature Dry Boiling Point in a typical DOT 4 fluid is 594 degrees F. The Wet Boiling Point is the temperature a brake fluid will boil after it has been fully saturated with moisture. The DOT 4 requirement for wet boiling point is a minimum temperature of 399 degrees F. There are many ways for moisture to enter your brake system. Condensation from regular use, washing the vehicle and humidity are the most common, with little hope of prevention. Glycol based DOT 3 & 4 fluids are hygroscopic; they absorb brake system moisture, and over time the boiling point is gradually reduced. Wilwood does not recommend using DOT 5 fluid in any racing applications. DOT 5 fluid is not hygroscopic, so as moisture enters the system, it is not absorbed by the fluid, and results in beads of moisture moving through the brake line, collecting in the calipers. It is not uncommon to have caliper temperatures exceed 200 degrees F, and at 212 degrees F, this collected moisture will boil causing vapor lock and system failure. Additionally, DOT 5 fluid is highly compressible due to aeration and foaming under normal braking conditions, providing a spongy brake feel. Whenever you add fresh fluid to your existing system (never mix fluids of different DOT classifications), it immediately becomes contaminated, lowering the boiling point of the new fluid. 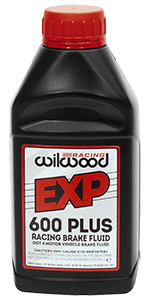 For maximum performance, start with the highest Dry Boiling Point available (try Wilwood EXP 600 Racing Brake Fluid), flush the system completely, and flush it regularly, especially after severe temperatures have been experienced.